The Hart Expressway Bridge (State Road 228) at Beach Boulevard (U.S. 90) will see construction rehabilitation activity until the spring of 2019. The rehabilitation project includes the coating of steel beams, bridge improvements including the minor repair of expansion joints, drainage improvements and the replacement of bearing pads which assist in the distribution of weight and movement on the bridge. 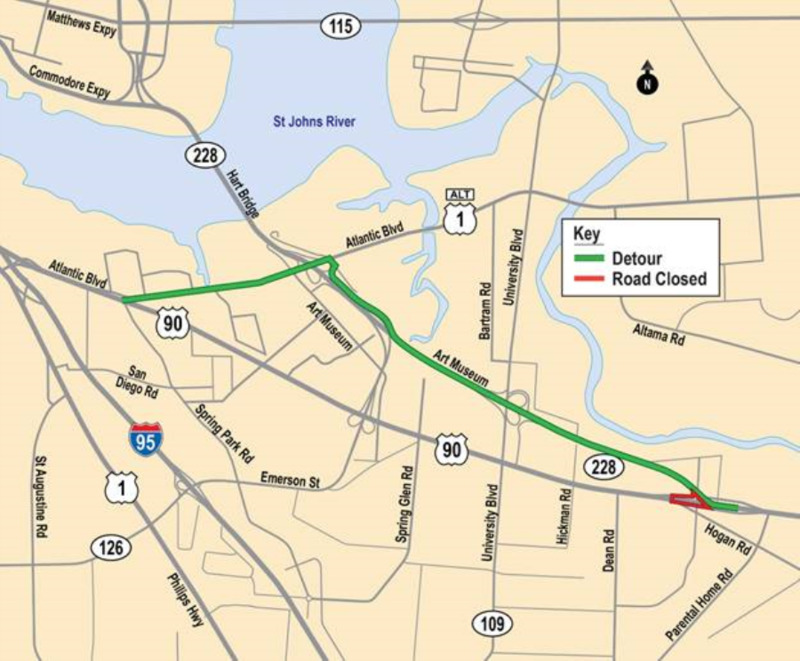 Westbound Beach Boulevard (U.S. 90) will see daily detours at the Hart Expressway Bridge (State Road 228) from Tuesday, January 8 through Sunday, March 31 from 7 a.m. to 6:30 p.m. as part of the Hart Expressway Bridge rehabilitation project. The detours are necessary for crews to sandblast and coat steel beams under the Hart Expressway bridge over Beach Boulevard. Westbound Beach Boulevard will be detoured onto westbound Hart Expressway and continue to Atlantic Boulevard. Drivers will then take westbound Atlantic Boulevard and reconnect with Beach Boulevard. Electronic message boards continue to be in place to alert drivers of the impending detours. Additional signage will be used to assist motorists throughout the duration of the detour. The $1.1 million project was awarded to Olympus Painting Contractors.